Dr. Aniruddha Chakraborty - Short term (6 - 12 weeks) internships are available from 1st June 2019. Short term (6 - 12 weeks) internships are available from 1st June 2019. Indian Institute of Technology Mandi, Kamand, Himachal Pradesh, 175005, India. Associate Professor: School of Basic Sciences, Indian Institute of Technology Mandi, Himachal Pradesh, India (2015 -). Assistant Professor: School of Basic Sciences, Indian Institute of Technology Mandi, Himachal Pradesh, India, 2010-15 (5 yrs.). Research Associate: Institute of Theoretical Sciences & Department of Chemistry, University of Oregon, Eugene, Oregon, USA. Advisor: Prof. M. E. Kellman, 2005-09 (4.5 yrs.) - Research Area: Understanding the origin of chaos in molecular vibrations. Research Associate: Condensed Matter Theory Unit, Jawaharlal Nehru Centre for Advanced Scientific Research﻿, Bangalore, Karnataka, India. Advisor: Prof. K. L. Sebastian, 2004-05 (0.5 yrs.) - Research Area: Non-linear vibrations in buckled nano-rod. Ph.D.: Department of Inorganic & Physical Chemistry, Indian Institute of Science, Bangalore, Karnataka, India, Advisor: Prof. K. L. Sebastian, 1997-﻿2004 (6.5 yrs. )﻿ - Research Area: Theory of single molecule transistor, buckled nanorod, two-dimensional electron solvation & curve crossing problems. M.Sc. : Department of Chemistry, Rajabazar Science College, University of Calcutta,﻿ Kolkata, West Bengal, India, 1995-97 (2 yrs.) - Subjects: Organic Chemistry, Inorganic Chemistry, Industrial Chemistry, Physics, Mathematics & Special paper: Physical Chemistry. B.Sc. : Department of Chemistry, Vivekananda College (Thakurpukur), University of Calcutta, Kolkata, West Bengal, India, 1992-95 (3 yrs.) - Subjects: Organic Chemistry, Inorganic Chemistry, Physical Chemistry, Industrial Chemistry & Bengali. Higher Secondary: Barisha High School, West Bengal Board of Higher Secondary Education, Kolkata, West Bengal, India, 1990-92 (2 yrs.) - Subjects: Mathematics, Physics, Chemistry, English, Bengali & Biology (additional). Secondary: Barisha High School, West Bengal Board of Secondary Education, Kolkata, West Bengal, India, 1984-90 (6 yrs.) - Subjects: Mathematics, Physical Sciences, English, Life Sciences, Bengali, History, Geography, Physical Edu. & Biology (additional). Primary: St. Elizabeth Girl's School, West Bengal Board of Primary Education, Kolkata, West Bengal, India, 1980-84 (4 yrs.) - Subjects: Mathematics, English, Bengali, History, Geography, Physical Education. Kinder Garden: St. Elizabeth Kinder Garden School, West Bengal Board of Primary Education, Kolkata, West Bengal, India, 1979-80 (1 yr.). Reaction-diffusion system: Fate of a Gaussian probability distribution on a flat potential with a sink. R. Saravanan* & A. Chakraborty, Physica A (in press) (2019). Exploring the role of relaxation time, bond length and length of the polymer chain in the kinetics of end-to-end looping of a long polymer chain. 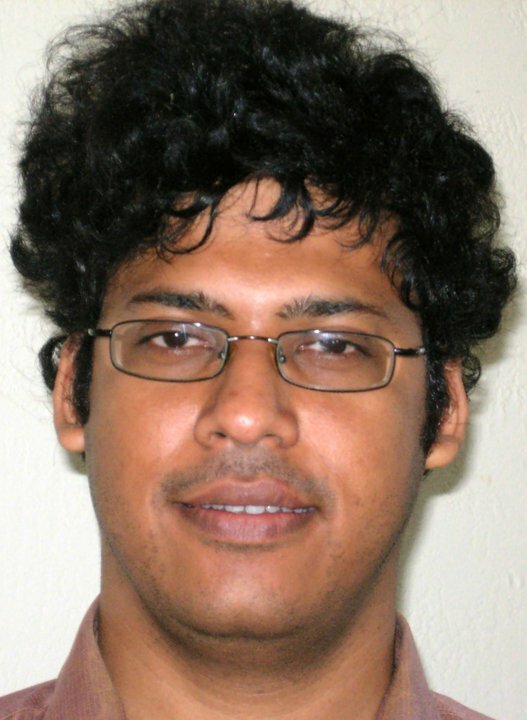 An exact analytically solvable model﻿, M. Ganguly* & A. Chakraborty, Chem. Phys. Lett. (under revision) (2017) link. Exact dynamics of a Gaussian wave-packet in two potential curves coupled at a point﻿. R. Saravanan* & A. Chakraborty (to be submitted) (2019) link. Diffusion on a flat potential with a sink of finite width: Exact analytical solution in time domain, H. Chhabra* & A. Chakraborty, Physica A (under revision) (2017) link. Diffusion on a harmonic potential with a sink of finite width: Exact analytical solution in Laplace domain, S. Mudra*, Hemani Chhabra & A. Chakraborty (under revision) Phys. Rev. E (2018) link. Exact dynamics of a Gaussian wave-packet in two potential curves coupled at a point, R. Saravanan* & A. Chakraborty (to be submitted) (2018) link. Effective Thermal Diffusivity in Real Solid. A. Chakraborty (to be submitted) (2019) link. Pre-dissociation of a diatomic molecule: An analytically solvable model. A. Chakraborty (to be submitted) (2019) link. Curve crossing induced dissociation: An analytically solvable model. A. Chakraborty (to be submitted) (2019) link. Multichannel scattering problem: Analytical method using Greens function. Diwaker & A. Chakraborty (to be submitted) (2019) link. Exact Solution of long range electron transfer through conjugated molecular bridge. Asish Kumar, Diwaker & A. Chakraborty (to be submitted) (2019) link. Barrierless reactions in solution: An analytically solvable model. A. Chakraborty (under revision) Phys. Rev. E. (2019) link. Towards Boltzmann Distribution. A. Chakraborty (to be submitted) (2019) link. Barrierless Electronic Relaxation in Solution: An analytically solvable model with arbitrary coupling﻿. A. Chakraborty (to be submitted) (2019) link. Electrochemical electron transfer: An Analytically Solvable Model. A. Chakraborty (to be submitted) (2019) link. Some exact results for the Smoluchowski equation for a parabolic potential with time dependent delta function sink. Diwaker & A. Chakraborty (to be submitted) (2019) link. Thermodynamics & electrochemistry, M.Sc. (Aug.-Dec. 2019). Mathematics for chemists, M.Sc. (Aug. - Dec. 2019). Group Theory & Spectroscopy, M. Sc. (Feb. - June 2019). Adv. Quantum Chemistry, M.Sc. (Aug. - Dec. 2018). Transmission of infection for spreading of epidemics﻿. Analytical model for evaluating autism. Impact of large animal extinctions on nutrient fluxes﻿. Airborne contaminant transport in vehicles. A model of fibrin gel formation. Plant Nutrient uptake - an analytical model. Modelling of ligand migration within protein. Reaction of neurotransmitters in a synaptic junction. Force induced rupture of bio macromolecule. Simple model for understanding electrocardiograms. Modelling mutation accumulation of cancer. Molecular Adhesion: A bio-technological process. Sound wave propagation & noise control. Heat flow through a vibrating solid material. Moisture diffusion in porous materials. Simple model for understanding Arnold diffusion. Bifurcation & Catastrophe map analysis of Hamiltonian system. Exact solution of Fisher's equation. Dressed basis method for matrix diagonalization. Levy flight in presence of a sink. Pinning and unpinning in non-local systems. Understanding the theory of ion solvation. Electron transfer reactions in single protein molecule. Tunneling of a ring through another ring. Comparison between ligands cyanide & carbon monoxide. Peeling of a polymer from surface. Random walk under random potential. Rotational motion of a proton crane. Jahn-Teller Effect using quantum cellular automata. Molecule with planar tetracoordinate carbon. Interaction between two rare gas atoms. Available M. Sc. (Chemistry) Projects* ﻿﻿﻿. Electron solvation in two dimensions. Vibrational dynamics from frequesncy domain spectrum. Understanding structure of carbon dots. Dynamics of H2 molecule trapped inside C60 cage. Understanding the bond formation of H-H molecule. Solvent effects on Raman ecitation profile. Forster Resonance Energy Transfer in long polymer chain. Simple model for understanding fluorescence blinking. Defining reaction coordinate in phase space. Understanding Casimir effect using a simple model. Trapping of tethered random walkers﻿. Bent wire: New bound state. ﻿Rate Theory in phase space. Ladder operator for bond dissociation process. Photoelectric effect - effect of electron correlation. Multi-state problems using quantum cellular Automata. Reaction dynamics on a continuum of energy surfaces. Adsorption & desorption of an atom. Estimating Tunneling time for simple model. Quantum Monodromy using effective Hamiltonian. Analytical solution od Poisson-Boltzmann equation. Motion of elelctron in DNA. Quantum Mechanics with restricted harmonic oscillator. Modelling Mechanical unzipping of DNA. Simple model of molecular ratchets. Hawking Radiation & Sine-Gordon Soliton. Exact solution of moving load problem. Modeling of contaminant transport in rivers﻿. Effective thermal diffusivity in real solids. Understanding water movement through fractured rock. Groundwater depletion from a confining layer. New zipping algorithm for big image files. Modelling dynamics of railway sleeper. Thermal diffusion in branched structures. Brownian Dynamics simulation of polymer looping. Buckling instability in a bio-polymer chain. * This is a rough guideline - just to help students. Students can choose any project, mentioned anywhere in this page or their own project irrespctive of their degree or discipline.